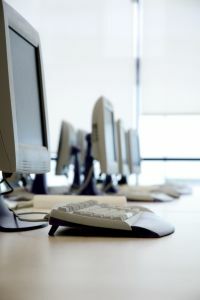 Computer training sessions can be time consuming, stressful, expensive, and inadequate when set up by yourself.� Setting up your own session will distract you from the goal of the session: training.� How effective would your training session be if the equipment is outdated, the software is not installed properly, or if you brought your projector, but forgot the screen? Any technology you purchase becomes outdated quickly.� Equipment rented from a TTA is always state-of-the-art. Do you know how long it will take you to set up your training session?� Take this unknown out of the equation by using a TTA. If some of the equipment does not work properly, we have spare equipment, just in case.� Do you? Your TTA will install, test, and troubleshoot all equipment and software before your training session.� This will help your session run without interruption, which will have the effect of increasing its effectiveness.� We will also provide technical services if such an interruption arises. Tech Travel Agents are experts with experience in setting up training sessions.� We will turn your technology problem into a technology solution, allowing you to focus on the other aspects of your session.� Contact a Tech Travel Agent today at 800-736-8772 or visit us online at http://www.techtravelagent.com/.